Today only! 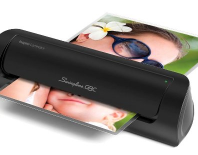 If you’re in the market for a highly rated laminator, hurry over to Amazon.com to snag the Swingline Laminator 9-inch Max Width for just $13.99 (reg. $51) + FREE Shipping with Amazon Prime or when you spend $25 or more with Super Saver Shipping. That’s a 73% savings!!! This price won’t last long, so hurry! * Amazon prices may change at any time.